The Japanese MITSUBISHI company was founded in Yataro Iwasaki in 1870. In 1934 MITUBISHI HEAVY INDUSTRIES, Ltd. was the biggest private company in Japan. It had business divisions for coal mining, shipbuilding, machine-building, manufacturing of aircrafts and railway choaches, bank houses, insurances and trading. Today companies and branches in more than 100 nations belong to this major corporation. MITTRONIK offers power generators with slow turning MITSUBISHI diesel engines in a range from 650 up to 2.000 kVA rated power. Depending on the application, various digital control panels are available: Automatic Control Panel for manual or automatic operation at mains failure (default), parallel operation (genset - genset) or mains synchronous operation (genset - mains/grid). 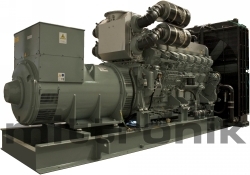 Thanks to many options, the generator sets are perfectly designed to suit the intended operating conditions: as standby genset for emergency power supply in hospital or as container genset for daily power generation on construction site.